JAMPS is calling for papers for the 2018 Winter Conference. Members interested in giving a presentation in the International Session at this conference should refer to the file below. Language used at the session is English. All applications will be reviewed by International Affairs Committee. The submission deadline for paper proposals is Saturday, September 29, 2018. Please refer to the following file for details. The Secretariat reserves the right to amend English title, if necessary. 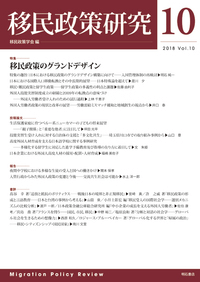 The Presence and Absence of Immigration Policy of International Student Migration to Japan: A Critical Review of Japan’s Recent Liberalisation of Highly Skilled and Skilled Migration Policies. JAMPS is calling for papers for the 2018 Annual Conference. Members interested in giving a presentation in the International Session at this conference should refer to the file below. Language used at the session is English. All applications will be reviewed by International Affairs Committee. The submission deadline for paper proposals is Saturday, March 10, 2018. We summarized as follows the presentations and discussion of JAMPS 2018 Winter Conference Symposium “Migrant Workers in Fish Industries: Nikkei-jin, Technical Interns and Foreign Students Contributing to the Japanese Food Culture”. To ensure the security of foreign workers on fishing vessels. To enhance the education and training of young Japanese fishermen and seamen. To attend to the issues of Asian Nikkei workers such as labor, residential settlement and child education. 15 min uphill walk from Kusanagi Station. What is “Little World Camp”? To download a report summary (pdf), click here . Why did South Korea decide to recognise multiple citizenship? If you are planning to take part in the party, please send an e-mail to the e-mail address below as we need to determine the number of attendees. Please write: "JAMPS Conference Party" in the subject line and provide your name and affiliation in the body of e-mail. Please pay the party fee on the day of the conference either at the conference registration desk or at the party venue.